After Commencing work twice of the the Glass house at Vaccine depot, at last it has taken shape and is likely to be made open for the public in the month of August 2016. It may be recalled that March 13, 2011 a foundation stone was laid by then CM BS Yedrurappa but the work never commenced. Then on June 9, 2015 District incharge minister again laid the foundation stone for the glass house which is a replica of the one in Lal bagh, Bengaluru. Spread over an area of more than 10,000sqft, the Glass House has been built on an elevated platform and surrounded by grill and transparent polycarbonate mesh, making its roof transparent. The Glass house will be managed by the Horticulture department and regular horticulture exhibitions are proposed to be held. 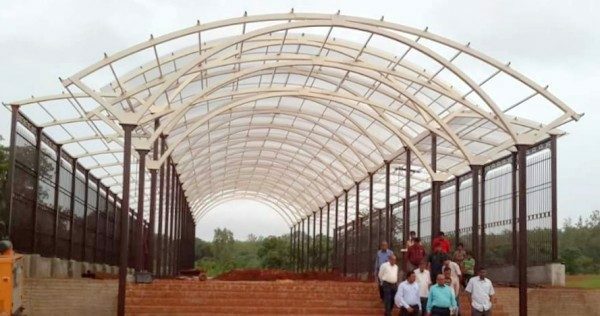 Rs 1.56 crore was spent on this Glass house construction inside the Vaccine Depot.